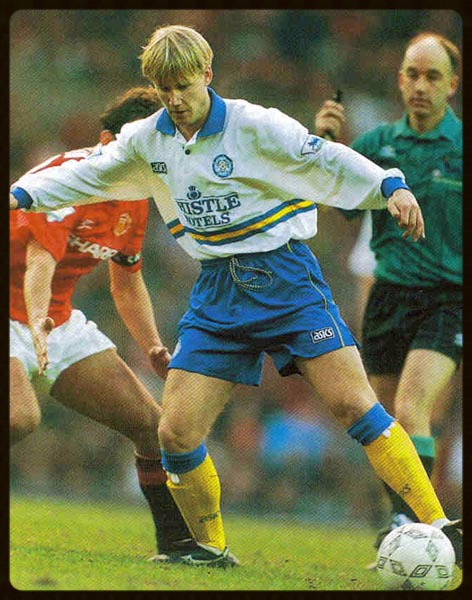 A member of the FA Youth Cup winning side in 1993, Kevin Sharp was seen as one for the future at Elland Road but unfortunately things didn’t go to plan for the youngster recruited from France. Kevin was born in Canada in September 1974 but when he was young his parents moved back to England. It was in the Blackpool league whilst playing for Poulton le Fylde that he first had the opportunity to display his promising talents before moving on to Blackpool Town and spending a couple of years at the FA National School of Excellence in Lilleshall. “From that England squad there were only Jamie Forrester and myself that were not tied to a club. The French side Auxerre, who had some of their young players in the national team, had scouts at the game and after playing well, I was invited over to train with them. “Everton and Leeds United had both expressed interest in me and I spent a week at Goodison Park. Howard Kendall wanted to sign me but they were unable to agree a fee with Auxerre. “I was then invited by Paul Hart to spend a week at Leeds. I loved it there and the fact that I knew Mark Tinkler and Noel Whelan from my time with England youth made it easier to settle in. The 1992-93 season was the first year of the newly formed FA Premier League. Leeds United started it with a victory over Wimbledon in August but the campaign quickly became one to forget. However, the youth team reached the final of the FA Youth Cup and went on to beat Manchester United over two legs. “It was a great achievement. Noel Whelan and Jamie Forrester were the deadliest strike partnership around at that level and with those two up front we always had a chance. We dominated them in key areas for large parts of both legs and thoroughly deserved to win the trophy. “I made just two substitute appearances in the 94-95 season and one in 1995-96 and part of the problem was that Wilkinson saw me as a left full-back. However, with Tony Dorigo in the side it was always going to be difficult for me to make the breakthrough. “Wilkinson had brought in experienced players such as Nigel Worthington, John Pemberton, Paul Beesley and Richard Jobson. It was almost as though he had lost his faith in the youngsters. “I was the first piece of the jigsaw. Dave Whelan said in the press conference when I signed that he had a 10 year plan to take Wigan up to the top flight and fair play to him, he did. “My time at Wigan was brilliant and I hold some fond memories”. After leaving Wigan in 2001, Sharp played for Wrexham, Huddersfield Town, Scunthorpe United and Shrewsbury Town before finishing his career at Scottish club, Hamilton Academicals. He went on to coach at Northwich Victoria (with Neil Redfearn) and Harrogate Town. These days, Kevin works for First E11even Sports Management as a Football Consultant and he enjoys the works he is doing. Thank you to Kevin Sharp for giving me his time and the opportunity to write this article.